In 2016 Willow embarked on an exclusive faux flower collection with OKA. The series perfectly captures Willow's wild and relaxed signature style. It features stunning, incredibly lifelike and everlasting pre-tied bouquets inspired by her favourite places. Each bunch comes beautifully presented in a marbled box with swathes of tissue making them a wonderful gift for any occasion. The 'Oxberry Hollyhock' Bunch - named after a street in London - features pink peonies, green hydrangea paniculata and tapering white hollyhocks. The 'Grimaud Peony' Bunch - named after a village in the south of France - features a pretty assortment of sweet peas, agapanthus, hollyhocks and delicate pink peonies. The 'Cheneraie Foxglove' Bunch features a stunning arrangement of white foxgloves, cream ranunculus, purple dicentra and a burst of green viburnum. The 'Chatterpie Iris' Bunch features a gorgeous arrangement of periwinkle and lilac irises complemented by cream lathyrus. The' Vaynor Rose' Bunch - named after the picturesque country house in Wales - features dramatic English double crimson roses and deep purple phalaenopsis stems paired with velvety lamb's ear leaves. 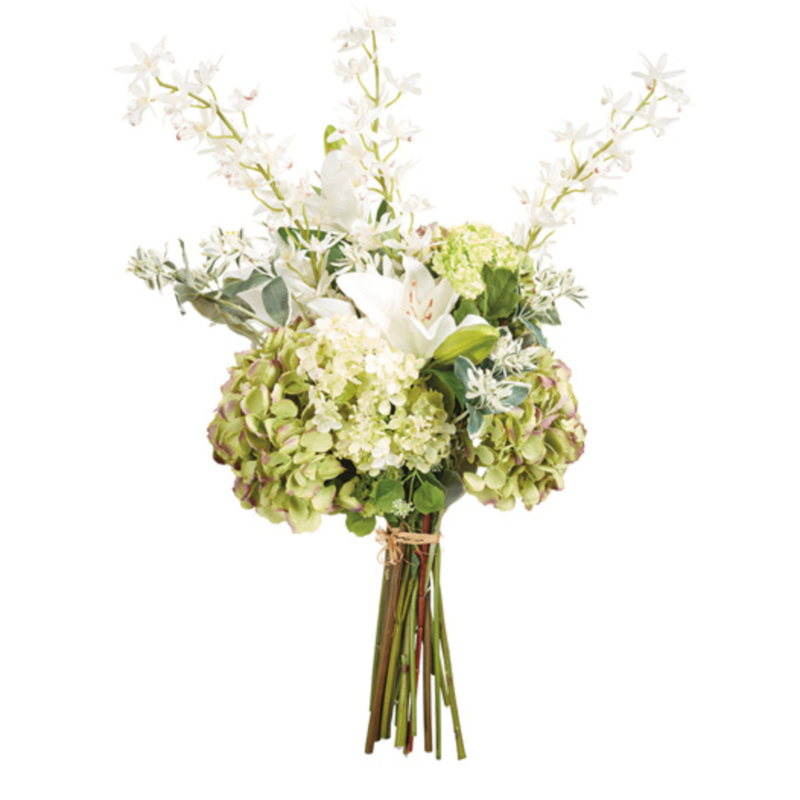 The 'Combe Lily' bunch - inspired by the pretty Oxfordshire village of the same name - contains white lilies, miniature cymbidiums, mop head hydrangeas, hydrangea paniculate, pittosporums and viburnums.